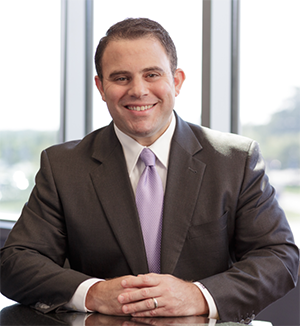 Sam Kaufman has a diverse practice representing businesses and individuals in complex litigation and real estate matters. Due to his experience, company executives often use Sam as outside general counsel to assist with a wide range of matters. Sam’s commercial clients hail from a variety of industries such as construction, transportation, automotive, title insurance, and banking. He is often called upon to handle contract and business disputes, transactional business matters such as mergers/acquisitions and private equity transactions, commercial and residential real estate matters, and leasing. Sam is also recognized as a leader in the area of real estate law and is often called upon to lecture on issues such as quiet title actions, access disputes, easements, and title insurance law. Sam began his legal practice in 2002 after earning a Juris Doctor degree from the Albany Law School of Union University that year. He is a native New Yorker and came to Richmond to attend the University of Richmond, Jepson School, where he earned a B.A. degree in Leadership with a minor in Political Science in 1999. While attending, Sam was a member of the Spiders’ Varsity Football team, 1995 – 1999, and was a Gwathmey Memorial Scholarship recipient, an award based on academic excellence. Sam and his wife Jordana decided to make Richmond home, and although Sam retains a hard driving New York attitude in his trial work, he’s an unassuming, approachable and well-liked local guy. With an entrepreneurial spirit and a natural leadership instinct, Sam was younger than most attorneys who collaborate to found a new law firm. He joined Joe Owen and Mary Burkey Owens in forming Owen & Owens PLC, relying on his work ethic and risk-taking mentality. Sam extends that earnestness to the local community: He is the Past Chairman of the Chesterfield County Chamber of Commerce, former Chairman of the Chesterfield County Economic Development Advisory Council, the Vice Chairman of the Chippenham Place Community Development Board, and is a current board member and former President of the Math Science Innovation Center Foundation Board. Sam also currently sits on two boards for the Commonwealth of Virginia; the Virginia Charitable Gaming Board and the Virginia Israeli Advisory Board. Sam is a senate appointee on both of these boards. Sam has earned the respect of his peers in the legal profession. He achieved Martindale-Hubbell’s highest AV® Preeminent rating for legal ability and ethical standards. Since 2009, he has been selected for “Virginia Super Lawyers Rising Stars” in the category of general litigation after an extensive peer review and editorial research process by Thomson Reuters. In 2012, both the National Trial Lawyers Association and Style Weekly magazine recognized Sam with a Top 40 Under 40 award. NTLA membership reflects superior qualifications, trial results and leadership as a young trial lawyer. Style Weekly’s Top 40 Under 40 names extraordinary young leaders for their contributions to the Richmond community. In 2013, Virginia Business Magazine named Sam to its list of Legal Elite in the category of business law. The Legal Elite are selected by their peers as being the most outstanding representatives of their practices each year. In 2017 Sam was named to the list of the Best Lawyers in America. Sam is a Fellow in the Litigation Counsel of America, an honorary society composed of less than one-half of one percent of American Lawyers. An avid Spider, Sam formerly served as the President of the University of Richmond (national) Alumni Association and is a former National Co-Chair of the University of Richmond’s Annual Fund. Further, Sam is a passionate music fan. Having followed some of his favorite bands around the country before assuming the rigors of a legal practice, he continues to enjoy playing the guitar and watching live music. Sam and his wife Jordana are the proud parents of two very spirited daughters.